Media can a powerful storytelling tool, whether it come in the form of film, television, music, prose, or games. We are just on the cusp of discovering how far we can go in the realm of games, and often we prefer our fare to stick to lighter, more fantastical themes. However, occasionally a game comes along that delves a little deeper, tackling a subject with a more weighty, tragic tone. This, dear readers, is one of those games. 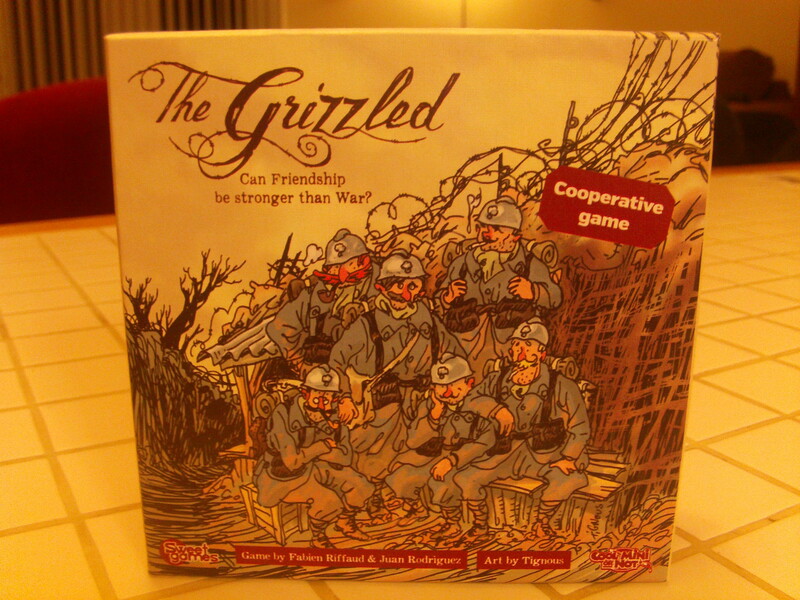 The Grizzled is a cooperative card game for two to four players from Cool Mini Or Not, in which players assume the roles of French soldiers trying to survive the horrors of war in the trenches of the first World War. 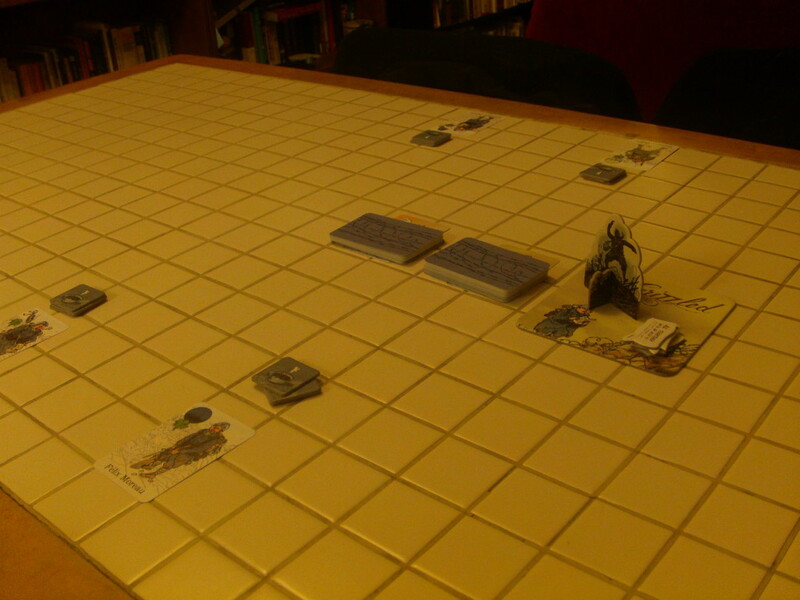 The game is rather simple in its execution: on the table are two decks of Trial cards. 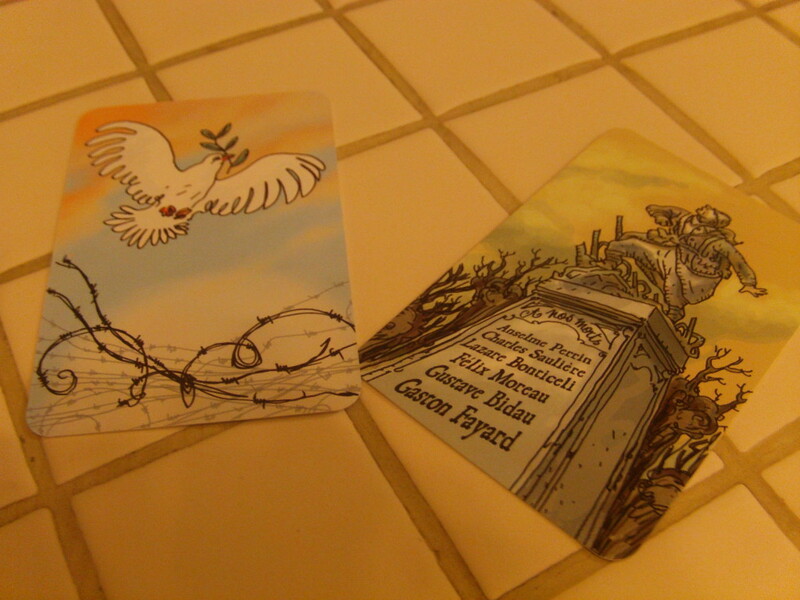 One stack is on top of a card displaying the white dove of Peace. The other covers a card displaying a monument. 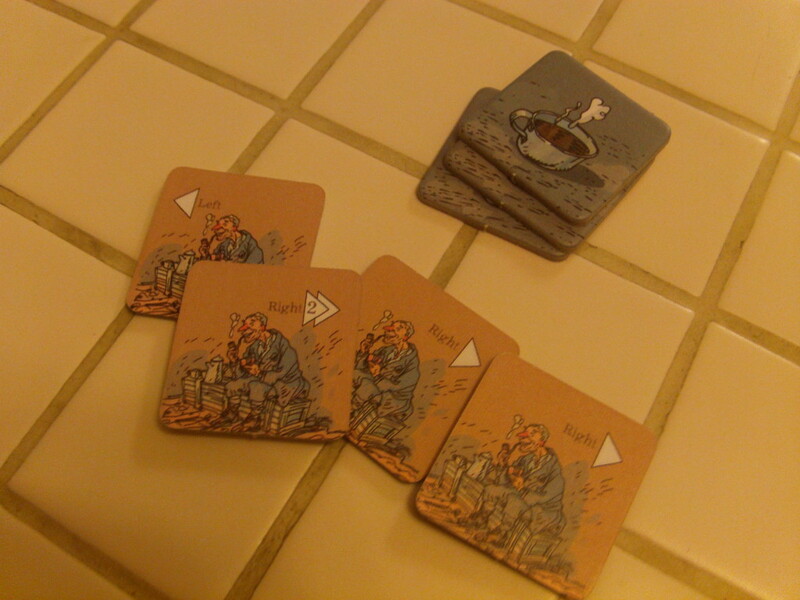 If the dove of Peace is showing and no players have any cards in their hands, then the players win. If at any time the monument is revealed, all the players lose- the implication being that the soldiers did not return home from the front. This is not a game of war in the sense of victory relying on conquest- to win this game, you need to just survive the dangers of the trenches. Each round, the player designated as the Mission Leader will decide how many cards to distribute to each player from the deck of cards on top of the dove of Peace. These cards come in two varieties- Trials and Hard Knocks. Trial cards have two components (or Threats): the background (either night, day, rain, or snow) and an item (either a gas mask, artillery shell, or whistle to call the soldiers to go over the top of the trench). 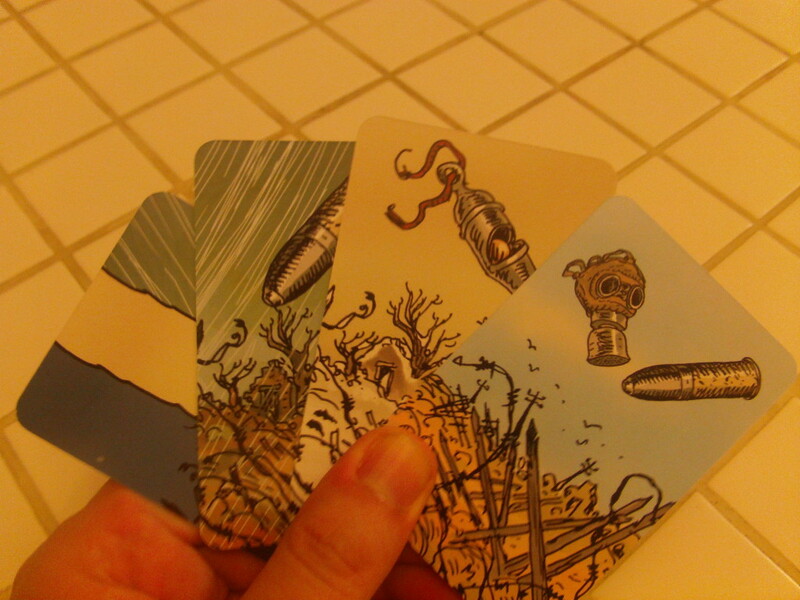 On each player’s turn, they may play a card from their hand. If it is a trial, it goes face up in the center of the table (in No Man’s Land) but if it is a Hard Knock, they place it face up in front of them. Hard knocks are bad news. 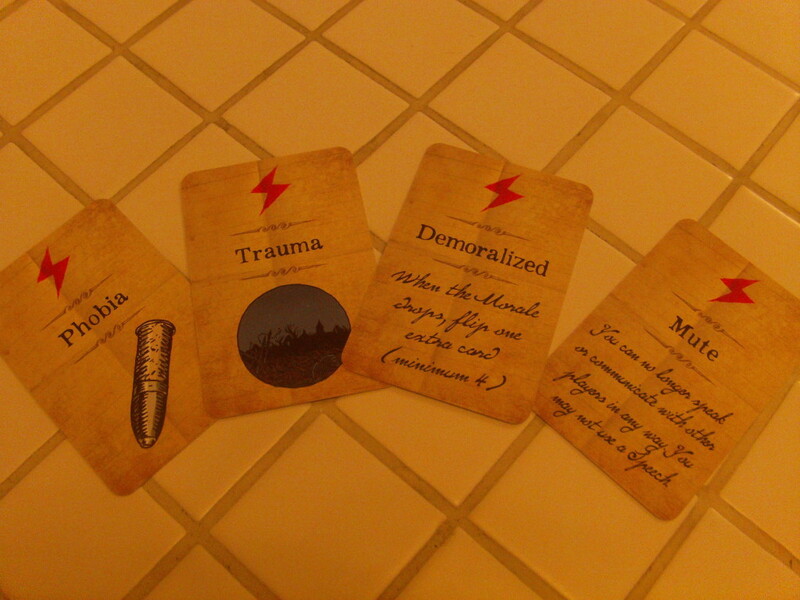 These cards will give you traits (such as Selfish, Panicked, Fragile, etc.) which will effect the game in various ways, which I will come back to in a moment. Furthermore, each Hard Knock has a red lightning bolt (except for one card that has two.) If at any time a player has four lightning bolts in front of them, everyone loses. That seems pretty straightforward, right? Play a card from your hand either in front of you or in No Man’s Land. However, if at any time a threat is repeated three times in No Man’s Land (so a third repetition of either the background or item) then that mission is considered a failure- the round is over and every card played in No Man’s Land is placed on top of the Peace deck. This is made worse by the fact that at the end of every round, whether the mission has been a success or failure, the morale of your squad drops due to the toll of surviving in the trenches. What this means is that you count up how many cards remain in the players’ hands and that many cards is transferred from the deck on top of the monument to the Peace deck. Remember, if the monument deck runs out, that’s game over. So what if you can’t play a card because it would cause the mission to be a failure? Well, you can do one of three things. 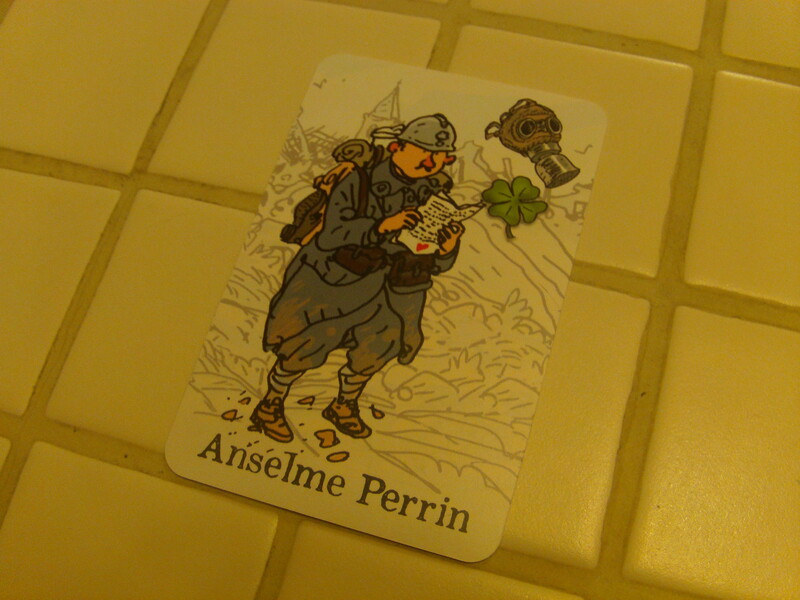 You could use your soldier’s Good Luck Charm: each soldier has a picture on their soldier card revealing a Threat. If they use their Good Luck Charm, they flip over their soldier card (showing it’s been used) and may remove a single card from No Man’s Land that shares a Threat with the one depicted on their Good Luck Charm. The second option is that they can give a speech. If they have a Speech Token (which they get for having previously been a Mission Leader) they can discard their token and name a Threat. Each player may then discard a card from their hand that has that Threat. The last option is to withdraw. If a player withdraws, they put down their hand and can no longer contribute to the mission. They then secretly vote for who they want to give support to using one of their Support Tiles. At the end of the mission (either because it failed or because everyone withdrew) players reveal their votes and whoever got the most votes may either remove two Hard Knock cards from their character or recover their Good Luck Charm. So what’s so bad about those Hard Knock cards? They will often affect when you can withdraw- essentially forcing you to play cards, even if it means that you fail the mission. When this is combined with the fact that you aren’t allowed to share with the other players what kinds of threats you have in your hand- it makes for a game of tense, strained cooperation. Often, due to choices you made earlier in the game, you’ll be forced to play a card, knowing that it will mean that your team will fail and bring you all that much closer to ultimate loss- the names of your soldiers chiseled into the face of that dour monument. 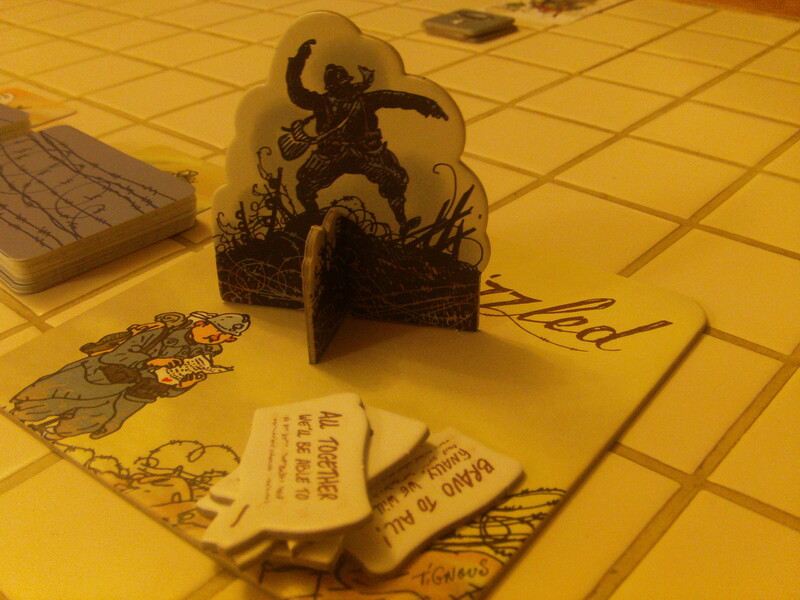 The Grizzled is a game that is really unlike many of the games out there today. The designers of this game (Fabien Riffaud and Juan Rodriguez) clearly set out to give their audience a different experience- one that handles a real historical event with the gravity and deference that it deserves. The instruction manual tells us, “Some of the characters in this game were real people. Some are the ancestors of people who worked on this game. The Grizzled is an homage to all the men who lived through this tragic period.” And this memorial is further driven home by the untimely death of the game’s artist, Bernard Verlhac (known by the pen name Tignous) who was killed in the Charlie Hebdo shooting last year. The people who created this game experienced real tragedy and loss- and their quiet determination shows through in the finished product. Will your squad make it out of the war to return home? All in all, this is a game that is both fun to play and shows you a side of war that is not often remarked upon. There is no glory to be had in The Grizzled, only a struggle for survival and a sense of comradery. The mechanics are solid and furthermore, they work together with the theme to instill in each player a sense of quiet desperation. So if you want to experience a game that is truly like no other, we here at A Space Ahead strongly recommend that you pick up a copy of The Grizzled and try it for yourself.